Synopsis: 30-year old Manato Kogane has been unemployed for a year. With dwindling savings and his youth slipping away, his only hope is a lottery ticket. When his lottery ticket falls into a pond, Manato jumps in after it and sees a mermaid. After some contemplation, he goes back to the pond hoping to take a picture of the mermaid so he can profit from the media circus. However when he actually meets the mermaid, she tells him that she is collecting coins from the pond so God will grant her wish to become human and find love. 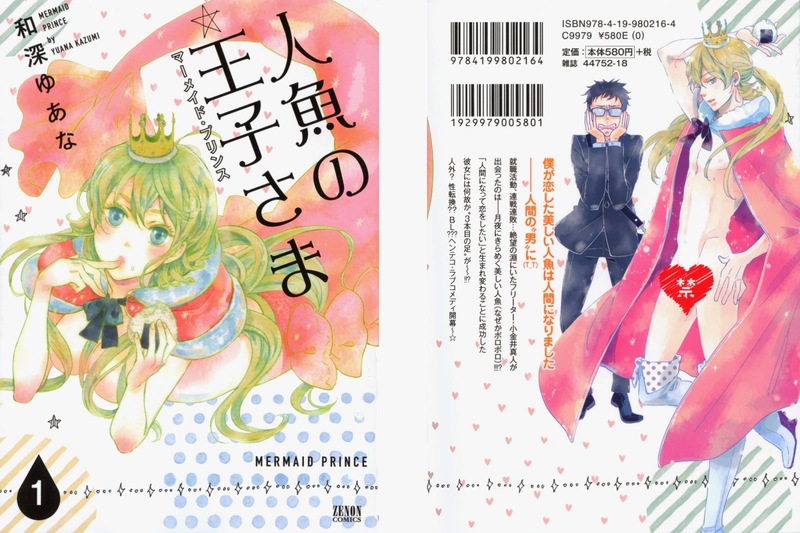 As thanks to Manato for feeding her, the mermaid gives Kogane her coins, but instead of using the coins for himself, Manato offers the coins and a year of his life to make the mermaid’s dream to become human come true. And with this, Manato’s life with the mermaid Sango begins. First Impression: Oh, the cover is really pretty, but should I buy this? It might be nasty “surprise”. No, it’s a clean gag-comedy gender-bending series! I love the artwork! Artwork A: The color page is gorgeous! I like the watercolor-look of both the cover, the color page, and the black-and-white comic pages. The backgrounds are detailed but don’t overwhelm the foreground. The mangaka uses sparkles, bubbles, and glow to enhance comedic and fantastic moments. The comedic moment are drawn in a exaggerated manner that made me laugh. The facial expressions show a lot of personality and “truth”. Overall, the characters look attractive, the facial expressions are clear, and the clothing styles are appealing. There is some “same face” amongst the “female” characters, though. Presentation A-: This manga is larger than a typical shoujo manga. It has a lovely color page and a gorgeous dust cover. The interior paper is typical for manga and the overall book construction is good. The binding handled bending and my typical abuse just fine. Story A: The first three chapters are episodic and the fourth chapter begins a serial story. The first three chapters feel very much like loosely connected oneshots. They detail the mermaid learning to live as a human and interacting with children and adults as “she” searches for love. There are lots of gender-bending gags, but they don’t drive the story. Rather the mermaid is like a alien who’s learning about humanity. “Her” reactions are pure and childlike which contrast against Manato, who seems tired of living. There are lots of laugh-out-loud moments, which are weaved nicely into the slice-of-life underpinning. Underlying the comedy in this first volume is a whole lot of the heart. The second chapter where Sango and Manato help a heartbroken grade schooler is especially cute. I related a lot to Manato. Life not going as expected and promised, but despite being world-weary he still has it within his heart to help another. I like him and I wish the best for him because he deserves it. His confusion over the gender-fluid mermaid is pretty funny and honest. Basically it’s analogous to “Water, water everywhere, but not a drop to drink”. The mermaid Sango is a free spirit with no understanding of humanity. But “her” pure and honest approach to living is refreshing and fun. Slowly we see Sango chipping away at Manato and their interplay is fun and funny. I couldn’t put this book down, and now I’m dying for the second volume. Readability Medium: There are no furigana in this manga except for names, but I knew a lot of the kanjis, so it wasn’t very difficult to read. I’d say it uses a lot of vocabulary typical to shoujo. The sentences also aren’t very long and convoluted. It’s pretty much like reading a simple shoujo magazine, but there’s no furigana. Overall A: I can’t recommend this series enough. The artwork is nice, the gags are funny, and the stories are really sweet and left me smiling at the end of each chapter. This is great if you need a mood boost. I wish manga series like this got licensed more often. It’s pure fun along the lines of “Kemono Kingdom: Zoo” and “Magical Change”.